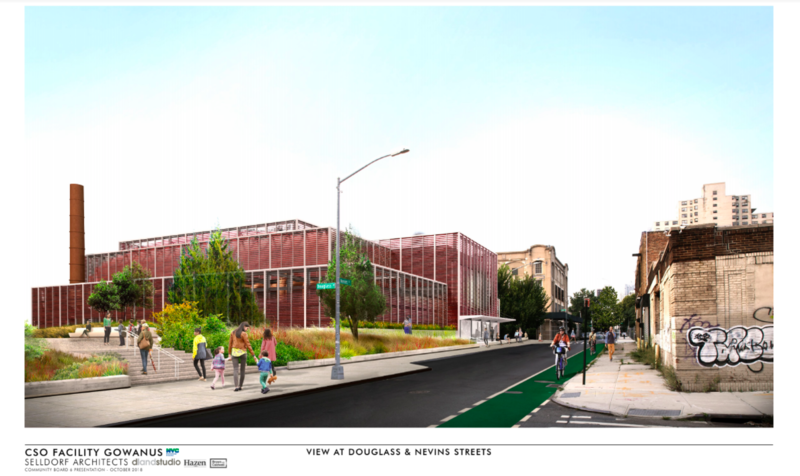 GOWANUS – The NYC Department of Environmental Protection (DEP) presented updated designs for the CSO tank and head house planned for the north end of the Gowanus Canal at the Community Board 6 Parks/Recreation/Environmental Protection Committee meeting on Wednesday evening at the Brooklyn YWCA. 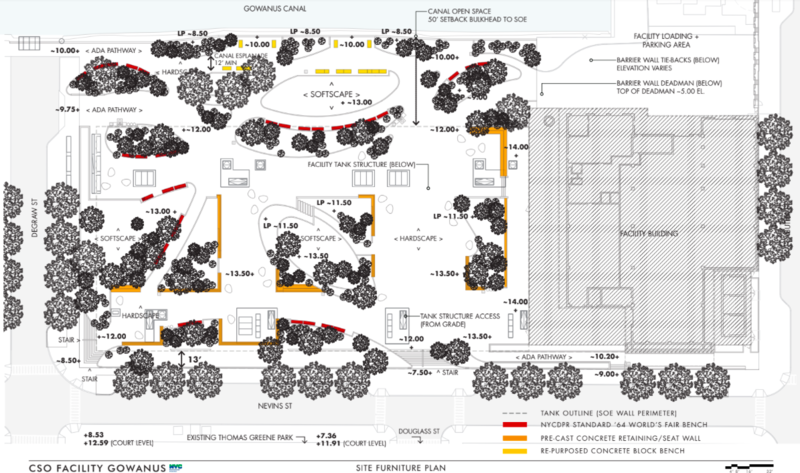 Following a public visioning session in July where the DEP first presented designs for the facility and adjacent 1.6-acre open space, the agency has incorporated community feedback into its revised plans such as new color and materials palettes, greenery for the open space, and a “sustainable, resilient” design for the head house that features a “transparent” facade as well as preserved architectural elements from the historic Gowanus Station Building (234 Butler Street). The 100-year-old Gowanus Station building located at 243 Butler Street, as well as 242 and 270 Nevins Street, are currently in the process of being purchased by the City under eminent domain and face demolition to make room for the eight million gallon Combined Sewage Overflow (CSO) tank and head house as part of the EPA’s cleanup of the Gowanus Canal. The CSO tank will hold excess rainwater and sewage during heavy storms, preventing it from flowing into the canal. A separate 4 million gallon CSO tank will be installed mid-canal by the Fourth Street Basin. “We worked really hard to create a facility that’s going to be efficient and safe for our operators, meet all our requirements for the EPA in terms of keeping combined sewage out of the canal, but also provides a really significant amenity for the community in Gowanus,” she added. Kevin Keating, of Selldorf Architects, presented the updated design for the head house, noting, “We’ve taken into consideration your feedback…and we’ve created a new color palette for the building.” The building’s exterior has been changed been from a white terra-cotta to an earthy “brick-toned” red. Other building materials will include copper, COR-TEN steel, galvanized steel, aluminum, and concrete. Keating explained that the head house will consist of “three components”—a primary mass, which houses the screening room where physical debris will be removed from the water; a secondary mass, which houses the electrical and mechanical components; and a tertiary mass for the odor control vessels and a [Con Edison] transformer. 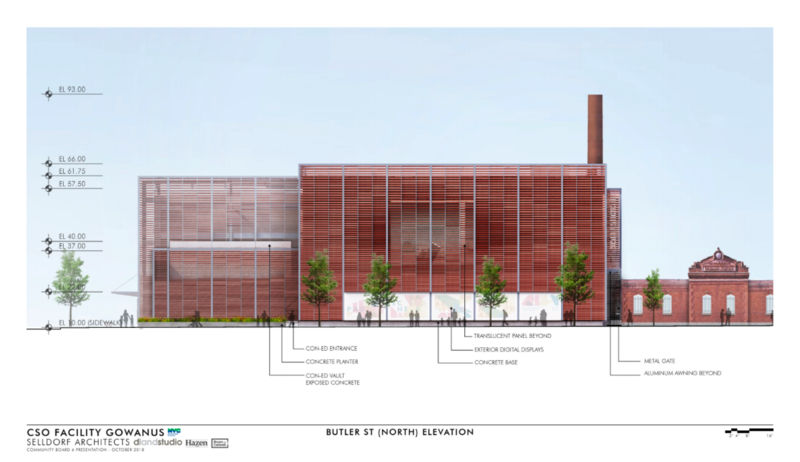 He noted that the building’s facade will be composed of a series of louvers that will “basically dissipate in certain areas [to] allow visual transparency into the facility to give a sense of openness and to also break down the scale.” The transparency will allow the public to get a glimpse of the machinery inside the head house as well as part of the CSO tank to see how the infrastructure works. Digital displays will be mounted at the ground level of the facility, both on Butler and Nevins Streets, to provide passersby with community news as well as educational information about the history of Gowanus and the facility. 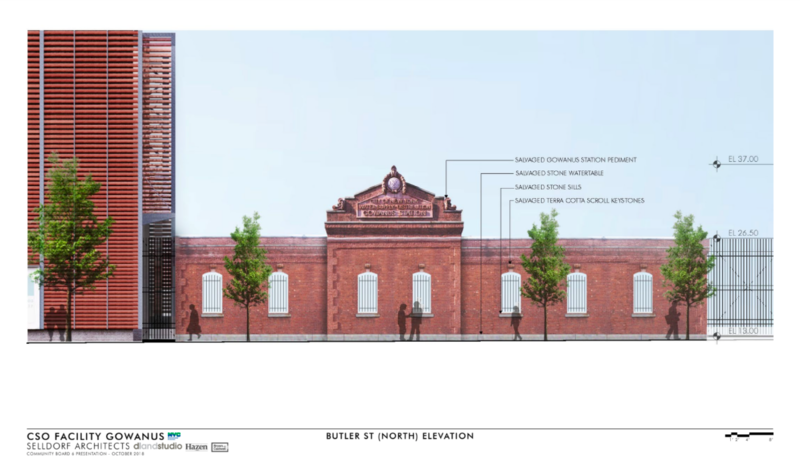 Unique architectural elements from the existing Gowanus Station Building, including the pediment and its plaque, scroll keystones from the windows, the stone watertable and sills, will be preserved and integrated into a brick street wall along Butler Street, west of where where the building now stands on the corner of Butler and Nevins. Local blogger Katia Kelly argued that given the high cost—”more than half a billion dollars” of tax payer money—DEP should listen to the community’s pleas to preserve the entire building and develop around it. Brad Vogel, a Gowanus resident and historic preservation advocate working with Mariano to save the Gowanus Station Building, noted that the draft Memorandum of Agreement [MOA] that would prevent DEP from prematurely demolishing the structure has not been addressed. “Under Section 106 of the National Historic Preservation Act, if there is a federal undertaking, the responsible federal agency [here, the EPA], is required to consider the effects on historic properties of projects they carry out, assist, fund, permit, license, or approve,” Vogel explained to BKLYNER. 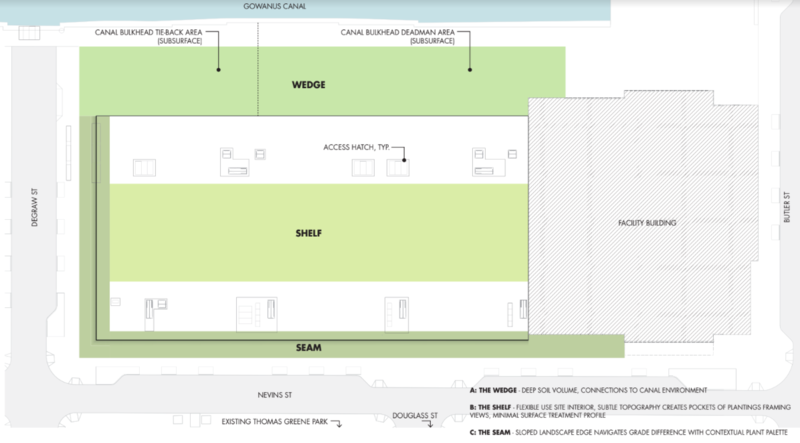 While the design for the outdoor space will need to provide paths to accommodate DEP trucks, Price noted that his studio will try to “steal back” as much green space as possible. He said that they will “plant this site as lushly as possible,” however, “given the soil limitations, it’s not an easy task.” He said due to the low soil volume on top of the tank, the plantings there will be “small, hardy [and] robust,” while further away from the tank there will be “greater opportunity for larger shade trees.” The design includes grouping small, multi-stemmed trees near seating to create as much shade as possible. The open space, which will be maintained and operated by the NYC Department of Parks, will offer space for passive recreation, public gatherings, step seating, seat walls, benches, ADA accessible sloped walkways, and “opportunities for park patrons to get right up to the canal’s edge to look across the canal, to see the neighborhood beyond.” An access point onto to the water has not been determined yet. DEP’s next steps for the project include a preliminary review and approval from the NYC Public Design Commission on November 14. 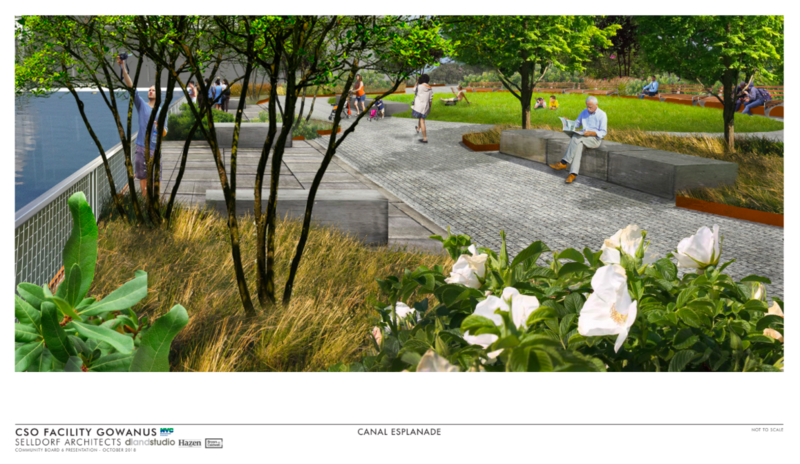 West adds that the Public Design Commission will also host a public meeting later to allow the community to provide additional comments before offering its own feedback on the designs. 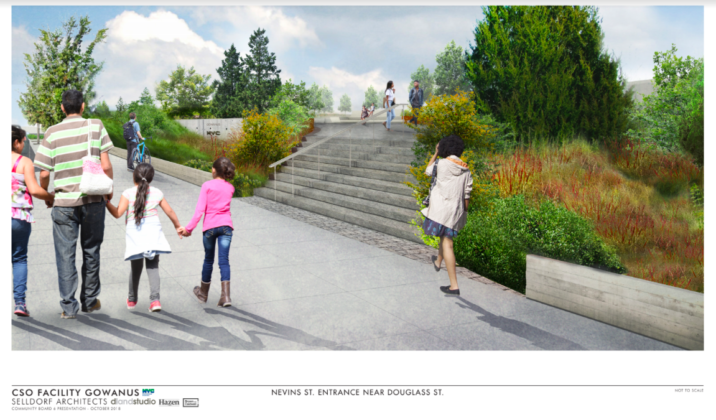 The DEP will continue to work with Council Member Stephen Levin’s office throughout the project and together will coordinate quarterly meetings to provide updates on the project to the community. West added that DEP will also assign a community liaison to the project whom locals can contact with any questions or concerns. Several in the audience seemed pleased with DEP’s revised designs. “It looks great. It looks so much better,” Peter Reich said. 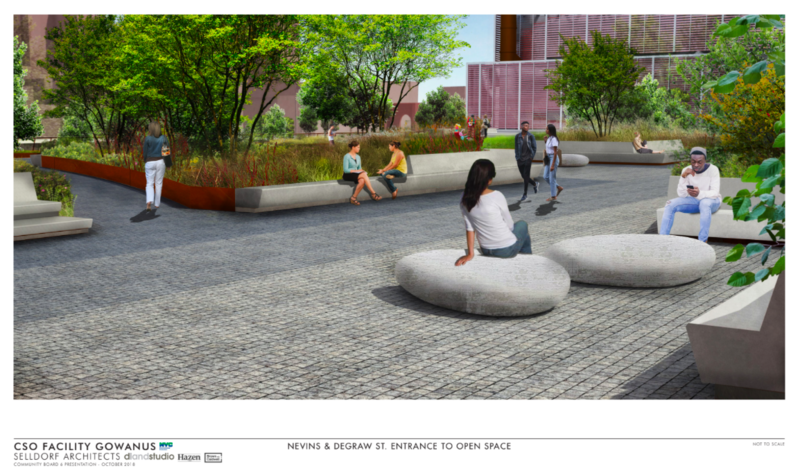 He told BKLYNER following the meeting that the updated plan looks “way better” than the initial renderings which he described as “cold, sterile, and empty.” He still has concerns about the plantings and whether there will be enough shade in the open space. 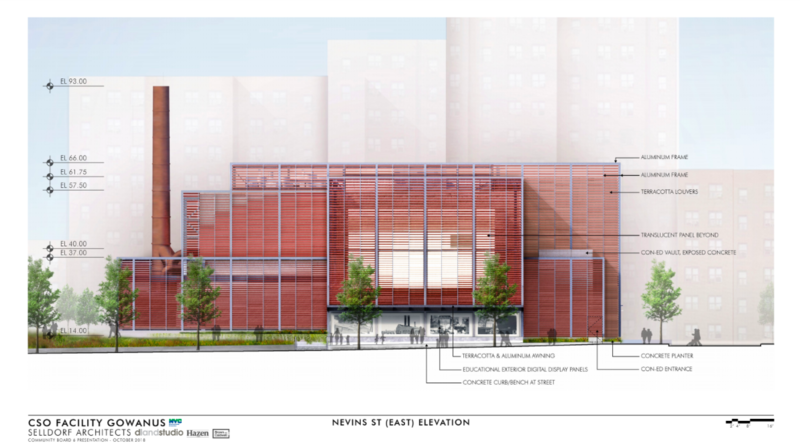 Click here to see the full DEP Gowanus CSO Facility presentation.